Choose the right configuration for your tower: (e.g. counterflow or crossflow; single - or multi-cell; forced- or induced-draft; closed circuit or open loop etc). Decide on construction materials that meet your needs - FRP concrete wood or steel - and verify that they correlate with the process water climate and other conditions on site. Choose the right design point for your application thereby optimi zing thermal efficiency increasing energy savings and sustainability and working within space constraints and budget considerations. Solve operational problems such as fan noise level clogging dust and sun effects poor water quality and composition. In many cases consulting us precedes any commercial or technical decision; in any case any inquiry is answered rapidly and taken seriously because we believe a professional and honest answer is highly appreciated by our customers. Delivery and installation of basic components such as cooling fill, drift eliminators, louvers, motors, fans including special low-noise fans, nozzles, water d istribution piping, fan stacks etc. Internal silencing mats reducing the noise level of cooing tower up to 9 dB(A). External silencers for air inlet and outlet for maximum silencing effect according to the most stringent requirements. Delivery of other accessories like electric heaters, water level controls, vibration switches, make-up water valves, etc. Automatic dosing stations, filtration units, by-pass water pumps. From design to delivery including static calculations tailor made to requirements or based on third party design. Design and engineering of FRP constructions for industry with focus on cooling towers. 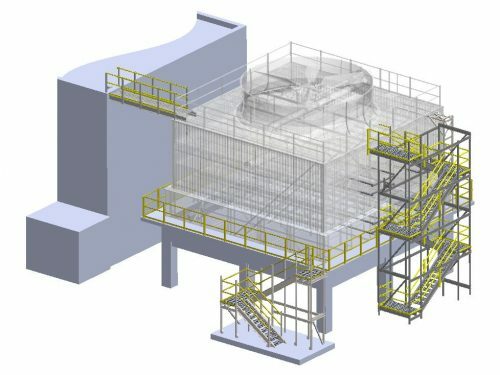 We provide 2D and 3D design of customized solutions for your plant along with the installation. Exchange of all necessary components and repairs of cooling towers with special attention to improvement of performance for optimal operation and minimizing maint enance costs. 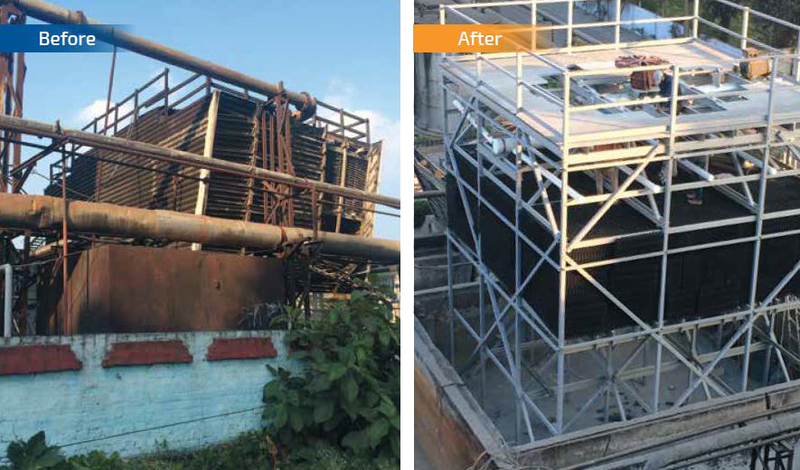 Upgrades and modernizations of obsolete cooling towers Client’s advantage by retrofit solutions lies in that we adjust new cooling towers to existing concrete basins, thereby saving our customer’s time, effort, and expense. Moreover, when a customer must keep production downtime to a minimum, we can design and erect the new cooling tower as modules near the operating one, and at the appointed time, remove the old cooling tower and position the new one inside the basin.